The flag carrier of South Korea, Korean Air is the largest airline in South Korea in terms of fleet size, international destinations and international flights. Founded in 1962 as Korean Air Lines Co. Ltd., operating as Korean Air, the airline commenced operations on 1st March, 1969. Korean Airlines has its global headquarters at Seoul, South Korea and its primary hubs are located at Seoul Gimpo International Airport and Seoul Incheon International Airport. Korean Airlines is among the Top 20 airlines in the world in terms of passengers carried. Korean Airlines flies to 139 destinations across 44 countries. 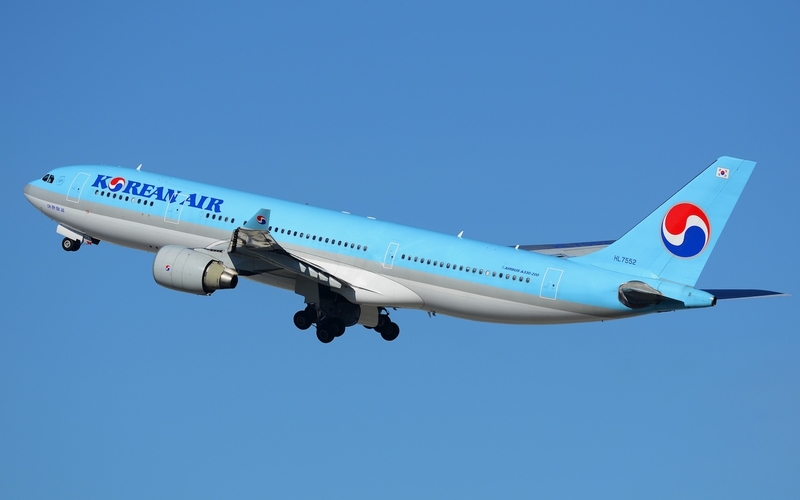 Korean Air is the parent company of Jin Air and is a founding member of the SkyTeam airline alliance. Passengers are advised to check their baggage allowance while booking their tickets. Korean Air offers best services, on-time and hassle-free operation at the best possible fares! Korean Air operates flights to its 139 destinations on a mixed massive fleet 174 passenger and cargo aircrafts. Korean Air flies to 12 domestic and 127 international destinations in 50 countries on 6 continents. Korean Air is a full cost carrier and its aircraft cabin is divided into three cabin classes. Complete privacy with tall partition doors, the seat is 79 inches long and 24 inches wide. 26.5 inches wide lie-flat beds, the back and foot rests are adjustable by the touch of a button. 78 inches long and 21.1 inches wide seats, a personal screen for personal as well as official work. Lie-flat beds with footstools, individual 17 inch LCD screens. No matter which aircraft you fly, Korean Air ensures you travel in style and are comfortable throughout the flight. A lie-flat 21.6 inch wide seats and ample amount of space between two seats to offer passengers complete privacy, all seats have direct aisle access. Prestige Sleeper seat is the same size as that of the Prestige Suite, seats have adjustable back and footrest at the touch of a button. 21.5 inches wide seats with 60 inches of space between two rows of seats that ensures complete privacy. Boeing 737 Prestige Seats are 21 inches wide and these seats are equipped with Audio and Video on Demand system. Seating is 30% wider than regular Economy seats. Economy offers ergonomically designed seats. The seats are 18 inches wide with a sliding cushions and 118 degrees reclining back. Economy seats have their personal 10.6 inch LCD with AVOD. As a SKYPASS member you can earn point each time you book a flight with Korean Air. Members can redeem their miles earned for buying tickets, upgrading class of travel, and many more services. Book tickets for 10 travellers or more with South Korea’s flag carrier Korean Air by FareHawker flight Group Booking desk. We offer Korean Air group fare facility for all travel portal, travel agencies, corporate & tour operator. Our ex-airliner team members are expert in handling small or large segment of Group Bookings. Korean Air Flight Lowest Group Fare - Buy Group flight tickets with FareHawker for booking international airlines group tickets on discounted fare. We are the largest consolidator for Group Air tickets in India and abroad. Post Your Group Booking Query for Korean Air. How to book Group Tickets in Korean Air Flight ? Any traveller, corporate, travel agency or individual can directly mail to FareHawker Group Desk team by asking for Korean Air flight group fare. Our group booking expert will get back to you on the same trail within 4 hours. Air ticket booking available at lowest airfare for Korean Air flights at affordable prices at FareHawker. Korean Air flight online booking - Book Korean Air ticket online at lowest air fare at FareHawker. Get best offer for Korean Air connecting India and abroad! Book Korean Air tickets with FareHawker as we offer the best-in-class fare options for all types of airline bookings. Our dedicated ex-airliner team with their in-depth industry knowledge offers you the cheapest possible fares for domestic as well as international travel. We take pride in our relationship with the airline partners and it is this relationship that allows us to offer you great travel solutions. We are here not only to find the best flights at cheap airfares but also to offer you consolidated travel services so you enjoy a seamless travel experience. Visit Korean Air FAQ for all related queries. Terms and condition of FareHawker and Korean Air apply.